It has been crazy busy times. 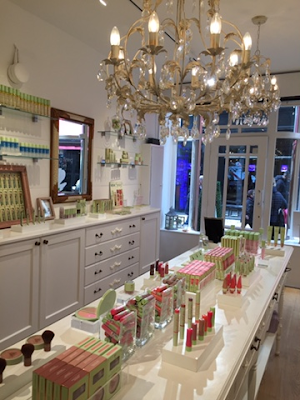 I just returned from London and i thought i share this little experience and products with you. 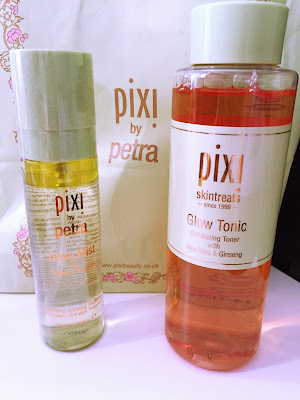 While in London i could not skip on visiting the Pixi beauty store. This products are available online in Belgium but i always loved to first test a product before i buy. So close to liberty in a side street of regent street i found the little shop. I appologize for the bad picture quality since i took them with my phone but what a lovely little store it is. All the products are beautyfully presented. I tested a few products and also swatched some make up products and i can tell you that they were all amazing. I would have loved to take home everything but seeing my rather extensive shopping list, i limited myself to two beautieful skin care products i heard so much about. The first one is the much spoken about pixi glow tonic. It is a wonderful astringent toner with 5% salicylic acid, aloe vera and ginseng. I was worried about my sensitive skin but i had no problems whatsover to use this. I put it on a cotton pad and wipe it all over my face. The lady in the shop advised that when you have very sensitive skin, you could aslo choose to start of with using it every second day and then slowly increase the treatments. However, since i did not notice any problems, i use this twice daily. It leaves a delightful litte sting on my skin which really does not feel uncomfortable. Not only does it leave my skin feeling refreshed, cleaner and radiant i also adore the scent. When i tried the glow tonic in store, the sales assistant applied some of their glow mist above it and i could not pass on this one. It makes the skin very very soft and is good for any skin type. According to the sales lady, it can even be applied over make up, i did not try that though yet, though i will be sure to try this out. Both products smell amazing and i feel a real effect on my skin. The shopping experience was wonderful. The sale staff was very friendly and helpful without beeing pushy (something i love when shopping). I left with a little bag with my two products and quite some samples and a smile. I will for sure order some things online but i will make sure to return to this little gem of a shop. That shop interior is DREAMY!